A growing number of sodas and concoctions are doing the opposite of Four Lokos and Red Bulls -- they're slowing things down. (CNN) -- It's not enough to fizz with carbonation and taste sweet. For years, drinks have been infused with promises of electrolytes, caffeine and instant energy. But now, some sodas and other concoctions are offering the opposite of Red Bulls and Four Lokos -- they slow things down. As more sedating sodas enter the market, some beverage makers have taken relaxation to another level by producing sodas laced with marijuana or ingredients to mimic that drug. "Everyone is looking for some effect somewhere," said Dr. Matthew Seamon, assistant professor in the College of Pharmacy at Nova Southeastern University. 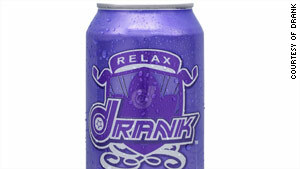 Beverages such as Malava Novocaine, Drank, Unwind, Mary Jane's Relaxing Soda and Slow Cow (sold in Canada) are marketed as helping people unwind. 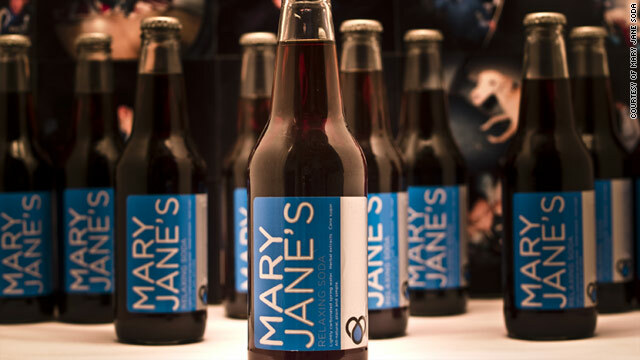 "When you are stressed out, normally you'd have a drink," said Matt Moody, founder of Mary Jane's Relaxing Soda. "You can't walk around smelling like vodka all day. I wanted to try to make something you can have to mellow you out. It's not going to make you stumble, fall down and slur your speech. It's a quick fix to slow things down when things get hectic." Critics question the safety of such anti-energy drinks, which are sold in locations including college campuses and convenience stores. Not many scientific studies about anti-energy drinks have been done, as they are just emerging in the market. Ronald Peters, associate professor at the University of Texas Health Science Center at Houston, points to similarities between street drug concoctions and the anti-energy drinks. Urban youths, especially in the South, started mixing codeine cough syrup with Sprite or candies such as Jolly Ranchers in the 1990s to make what's been called "purple drank" and "sip and syrup," Peters said. He called the marketing of commercialized anti-energy drinks "one of the worst things I've ever seen with corporate immorality," accusing the companies of profiting off a higher-end version of a street drug. And a lot of parents aren't aware what these soda-like drinks do, he said. "The modeling of this drug is worse than candy cigarettes," Peters said of the widely available anti-energy drinks. "It actually has sedatives in it. They didn't have quasi-nicotine in candy cigarettes, but this one has it in it. It makes it an unethical product." Drank is now sold as a supplement, rather than as a beverage, in order to keep melatonin as an ingredient. Some anti-energy drinks carry warning labels of possible drowsiness and discourage driving after use. Peters likened the drinks to a gateway drug -- kids who buy the commercialized products are more likely to try the candied codeine cough syrup mix. Beverage makers say that their products are safe, and more so, that they help people. One company called the product "a positive alternative" to drugs and alcohol. Tim Barham, president of Frontier Beverage, which produces Unwind, said his company's drink is not "associated in the same realm at all" with the cough syrup mixtures. He said Unwind appeals to "high school and college students, soccer moms and Wall Street executives" to promote relaxation after a stressful day. Unwind and other drinks contain melatonin, a neurohormone used to treat sleep-related disorders that can be purchased as a supplement. Some studies found that melatonin can interfere with testosterone, so some sleep doctors don't recommend using the supplement until boys reach college age. Melatonin is not approved as a food additive because it is not "generally recognized as safe" by the U.S. Food and Drug Administration. So a company that uses the ingredient can be subject to a challenge by the FDA. Last year, the FDA warned the makers of the relaxation drink Drank about its use of melatonin, calling it "an unapproved food additive." Drank sells its product now as a dietary supplement, rather than as a beverage, in order to contain melatonin, according to a company spokesman. The FDA had no further comment regarding the matter. Many of the anti-energy drinks contain exotic but innocuous-sounding ingredients like kava, melatonin, valerian root, rose hips and passionflower. Seamon said such supplements could have risks. Recalling how the original colas more than a century ago contained cocaine and lithium, when they were considered benign, Seamon said today, the companies are "a step above regulators. Maybe the science and risks haven't been documented." The latest relaxation drink to capture headlines is Canna Cola, a marijuana-infused soft drink. The product contains the chemical THC and is scheduled to go on sale in medical marijuana dispensaries in Colorado this month and expand to California. The drinks will be available only in medical marijuana dispensaries to people who are legally permitted to buy them. Despite its colorful and cartoonish branding and flavors like lemon-lime, grape and orange, the product is not marketed toward children, said Clay Butler, co-founder of Canna Cola. He acknowledged that some critics "are nervous about products like this. I think they're incorrect and there's misguided fear." "This is medicine, and you should take it as you would with any prescription drug," Butler said. Canna Cola's ambitions extend beyond medicinal drinks into producing more widely available relaxation drinks that don't include marijuana, Butler said.